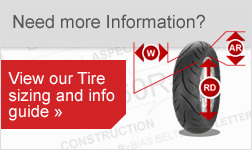 When selecting new motorcycle tires, be sure they meet the requirements of your motorcycle and its expected usage. Please use our vehicle drop down selector at the top of this page to assist you in choosing a tire for your vehicle. Always refer to your owner’s manual for correct tire specifications for your vehicle. Inspect and check tire pressure often. This is the most important tire-maintenance function you can perform. Refer to your machine's documentation for proper maintenance. Always give tires a gentle "run-in" period of 100 miles to get the feel of new tires--this means they should not be subjected to maximum power, abrupt lean-over, hard cornering, etc. Always match the front and rear tires for optimal handling, safety and performance. Mixing radials, or mixing radials with bias or belted-bias tires, may adversely affect handling and stability. The charts and information on this page do not imply interchangeability. Consult your machine's manual to determine correct replacements, clearances, compatibility and stability, load-bearing capacity, speed rating, radial vs. non-radial, pattern and tread compound requirements, inflation recommendations and front-to-rear tire matching. Wrong selection can result in tire failure or loss of control with serious injury or death. When you’re ready for a trip, make sure your bike is too with the Bridgestone G704 Exedra Touring Motorcycle Tire. Bridgestone’s uni-directional pattern on the G704 gives it excellent traction, meaning you’ll have reliable grip whether you’re riding in rain or shine. If you’re concerned about longevity or quality, the G704 is built with Bridgestone’s usual quality and designed specifically for today’s American style touring bikes, so you can rest assured knowing you’ll get plenty of miles from your set. In fact, the G704 does its job so well, Honda uses it as original equipment on the GL1800 Goldwing. Experience a new adventure, enjoy the outdoors, and admire newfound scenery with some of the best rubber available in the Bridgestone G704 Exedra Touring Motorcycle Rear Tire. I have nearly 9,000 miles on this tire and I am hoping for 15,000. Feels stable and ready for the road at all times. I am very pleased with this product it performs as it was advertised and exceeds my expectation what highly recommend to anyone. I my opion the bridgestone G704 is the best tire I have tried on my gl1800. Third set of these on my Goldwing. Average about 10,000 miles with good handling and traction right to the end of tread life. Minimal cupping with Dyna Beads for balance. Ride the mountains regularly with great stability wet or dry. What a great price on my Bridgestone for my Goldwing! Quick shipping and wrapped well. Could not beat the price. 214.00 with the 60.00 Bridgestone rebate! Just recently installed these on Honda Goldwing 1800. Love how they handle, Very smooth and grip the road great. Last three sets of Dunlop Elite 3, nothing but separation and vibration. Fine at first then trouble after a few miles. Put this on my 2012 Victory Cross Country and it handles great in all weather conditions and wears well. Great tire at a great price. Youy guys are great! Expeditious service and lowest price! Refering friends now! These tires are fantastic. First test ride after installation was on very damp roads. Zero issues with traction outside of a heavy right hand. Love them so far. Have logged over 150,000 miles on a GL1800 with Bridgestone tires. 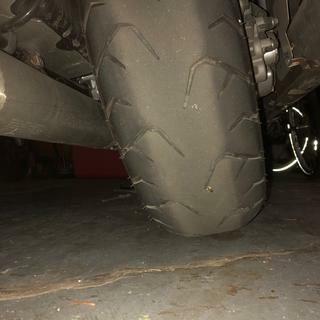 I get about 6000 miles out of the rear tire. I do ride a little aggressively. These tires have always performed to my satisfaction. Other tires I have tried can't compare to the Bridgestones for handling. I rate the tread life high because I know you can get well over 10,000 miles out of a set of Bridgestone tires if you ride like - well normal. First, Rocky Mountain ATV/MC...you rock! Best price anywhere on these tires. Received two sets ordered a week apart both within two days. Lightening fast! As for the tires...I would like to have got a greater amount on my first set. I had just shy of 11,000 miles on the rear. The front may have had another 2 to 3,000, but a cross country trip made it most reasonable to replace both at the same time. Regarding handling in dry, wet and other conditions...love the tires for this. just having purchased the set a couple of weeks ago so I cannot comment on tread life; and, it hasn*t rained in south texas for a while, so no comment on that either. however, based on other reviews they are rated better than most others. I am very satisfied with my purchase of these stones for now. Oh, and no noise at all like the dunlops. Excellent product handling is extremely good this is my third one, mileage about 20.000,I do a lot of two up and sustained 70 plus mph with no problems. This is by far the best tire for the F6B version of the GL1800. Great traction in dry or wet conditions, sticky enough to rate well in the twisties and hard enough to give you a long lasting tread life, I routinely get 15,000 out of the rear and 30,000 on the front, and I am no freeway cruiser, love my back road twisties for sure. And having searched all over the web Jake Wilson has by far the best price on this and many other tires. Going back to the the tires that came on my bike was one of the best decision that I have made in some time. Butting them back on changed the handling for the better and I get more Km out of these tires than anything else that I have gotten out any other brand. great tire! from Indiana to Oregon and back!! great traction in the rain and a comfy ride too. This Bridgestone tire works better for the Goldwing than any other tire I have tested. The wet and dry grip is exceptional. Decent life, maybe not as good as others but I am willing to sacrifice wear for grip any day. 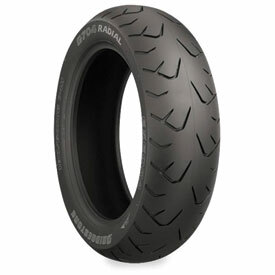 Tried them all and this one works the best out of all the motorcycle tires available for the GL1800 Goldwing. Great mileage but even better it the predictability when it slides around corners. Never worry about highsides with this tire on the rear. Just ease up pressure on the inside grip a little while staying on the gas and she lines right up. Wouldn't run any other "motorcyce tire" again!